From the Ponder Couch: A Celebration of International Rocketship Limited! A Celebration of International Rocketship Limited! I've always considered myself an odd duck. This is mostly because my interests were different from those of my peers all through childhood, teens, and adultitude so far. One of the odd things I've always loved is cartoons. Especially if said cartoons are odd ones. Back in the 80s and 90s, before such wonderful things as "Adventure Time", "Phineas and Ferb", and "Uncle Grandpa", the only place I saw odd cartoons was Nickelodeon. I loved Nickelodeon, and still love the Nick shows I watched as a kid. 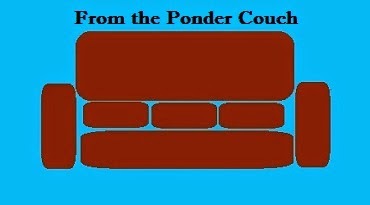 (look for Pondercast Episode 3: Nickelodeon, coming soon!) They showed such wonderfully absurd things as "Rocko's Modern Life", "Ren and Stimpy", and International Rocketship Limited cartoons! Here are the 3 IRL cartoons I remember Nickelodeon showing between their other regularly-scheduled programs. But Nick wasn't the only place I saw IRL 'toons! We had a video tape with some movies taped off of Showtime or HBO (I think it was "The Naked Gun" and "Ghostbusters"). Near the end of this tape they had this not-safe-for-Nick toon, and it bewildered me. I loved it! Those are the only IRL cartoons I'd seen as a younger me. When I looked them up more recently I found a few more. The next video is one that fits with the others. I think it was the first IRL toon. There are a few more IRL toons out there, but those weren't as influential on me as a young lover of odd. I will include one final toon that is not IRL. It's a Chuck Jones Looney Tunes cartoon without any recognizable Bugses or Daffy Ducks. It is one of my earliest memories of loving something simply because it was odd. :Ladies, Gents, and not-so-genteel people, I give you "Now Hear This"!